Vi is a chandelier commissioned by the Antica Fratta wine firm for an exhibition focussed on "artistic, historic, industrial" glass pieces. 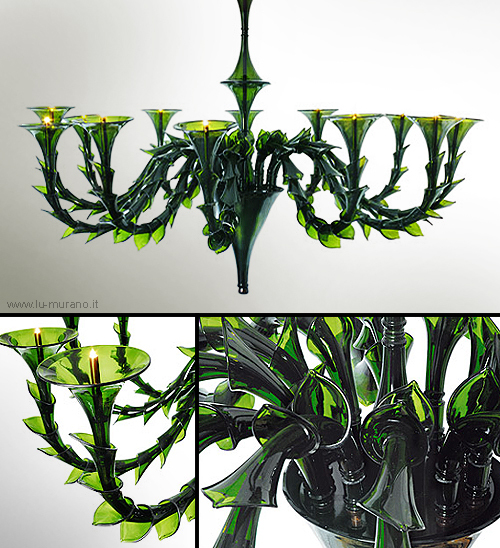 It is made up of 180 Franciacorta wine bottles that were cut down and hot-worked in the glassworks to be transformed by Venetian master glassmaker Fabio Fornasier into the component parts of a Rezzonico-style Grand Chandelier (Ca’Rezzonico Palace,Venice,1700). Designed to celebrate the kinship between wine and the pure material in which it is held, Vi is historic in its Venetian heritage, artistic as only a piece bearing the "made in Murano" label can be, and as industrial as the raw material it is made from, namely bottle glass. A work of art that, with each element, conveys artistic creation and the slow, tiring work of the artisan.